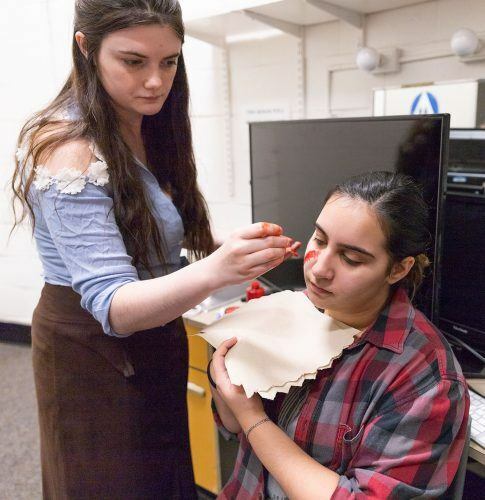 Jordan Nelson, junior theater major, applies makeup to look like a scar on freshman music major Danielle Hernandez for the haunted house Tuesday night in Dailey Theatre. She gets the actors ready for the haunted house by applying special effects makeup to make each character look as real and scary as possible. Nelson is 20 years old and came to La Verne from a small town in the high desert, Hesperia. While Hesperia is her home, it was missing one major thing, a serious concentration on the arts. Nelson began dabbling in special effects makeup after watching early makeup tutorials in 2013, where she realized it was a form of artistic expression she had never attempted. “It was really cool because it takes painting and sculpting and combines it with acting,” Nelson said. Her first initial looks were done entirely out of cheap eyeshadow and eyeliner, when she said she had to use whatever was available. “I love to create a different world on the stage that people can become engulfed into, like a fully formed environment for people to go into, an interactive world that’s completely different from their own,” Nelson said. One of the most redeeming aspects of continuing to practice her skill, she said, is the reactions she receives. “Early on many reactions were like, ‘Aw that’s neat!’ Now I’m hearing, ‘Woah! That’s genuinely unsettling.’ It’s a really fun art form,” Nelson said. She described it as a fun, childlike and immersive experience where one can enjoy acting as the character and art piece after the initial creation process. Now at La Verne, she’s already making a name for herself with her mastery regarding set design and special effects makeup. Jane Duran, junior communication through the arts major who also minors in theater, worked closely with Nelson on the Cabaret Student Productions haunted house last week. She praised Nelson’s creativity and ability to brainstorm and draft incredible ideas on the fly. “Have you seen her Instagram?” Duran said. Duran was not the only person who mentioned Nelson’s Instagram account, @aqua_radish_sfx. In fact, every person spoken to raved about Nelson’s special effects skills and insisted a look at her page. She has an impressive talent for bringing monsters, aliens, zombies and other creatures only seen in nightmares and novels of fiction to life in a way that seems beyond belief. One post stands out specifically, a picture that shows a mummy with a face that looked completely decomposed, created entirely by Nelson. While Nelson’s makeup artistry appears to have gained her notoriety, her main love is set design. She hopes to turn her degree into a profession in set design. She said she admires the imagineers who create the attractions at Disneyland and could see herself fitting into that niche. An enormous amount of work goes into creating the set designs. Whether it be a stage production or a haunted house, Nelson is at work many months in advance to properly prepare. She brainstorms, sketches out different ideas, crafts themes and story lines, refines the story, draws up the makeup for the monsters, and collaborates with other production team members to get everything down to a science. She’s currently working on her senior project, a stage production of “The Picture of Dorian Grey,” where she is involved in the actual transformation of Dorian himself, as well as the elaborate set design a production like this entails. Students can expect the productions debut next year. Jocelyn Arceo also contributed to this story.